BlueSky Cinemas, one of the leading players in the overseas market for Telugu movies is now venturing into Tamil movies as part of its expansion plans. 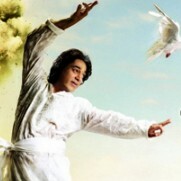 They have chosen the biggest South Indian film in recent times, Vishwaroopam, to forward their interests. BlueSky will be distributing both the Tamil and Telugu versions of this movie in North America (US & Canada). 1. It’s the biggest South Indian movie in recent times and has been shot very lavishly on par with Hollywood standards. 2. It’s the first Indian movie that is employing the Auro 3D technology. Auro 3D is a new ground breaking three dimensional sound technology that gives a real life experience with respect to sound. 3. Popular Hindi music directors Shankar – Ehsaan – Loy have composed the music for Vishwaroopam. 4. Several Hollywood technicians have been roped in for this project to achieve international standards through more innovation and creativity. 5. Vishwaroopam’s music album occupied a prominent place on the iTunes chart within just a couple of hours on its release day itself. Vishwaroopam is a trilingual (Tamil, Hindi and Telugu) that has been written, directed and co-produced by Kamal Haasan, the man who needs no further introduction. Kamal Haasan has acted along with Pooja Kumar, Andrea Jeremiah, Rahul Bose and many others. BlueSky is really excited to bring this hi-tech visual feast to the North American market and will be releasing the movie in a grand way with red carpet premieres on Jan 10th all over the US and Canada. BlueSky wishes all overseas patrons a Happy and Prosperous New Year 2013! Note: In overseas we will have only a theatrical release and Video on Demand will not be available as long as the first theatrical run continues for both the Tamil and Telugu versions.